I decided to go ahead and try an Illustration Friday entry. OMG, it has been FOREVER since I have done this. 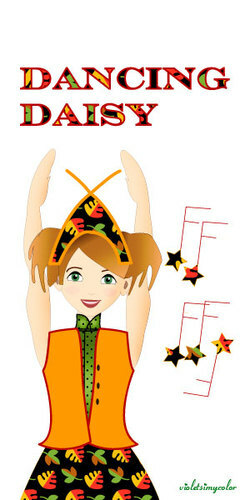 My Adobe Illustrator skills are so dusty. But, when I thought of Instinct, I thought immediately of the instinct someone would have to excel in what they do. As the Oscars were on this week, I decided to do an Oscar-themed drawing. And, to be clear, I totally agreed with all the Oscar voters when they voted for Kate Winslet, Sean Penn, and Slumdog Millionaire. I am a big fan of all three. A quick scribble is in order. 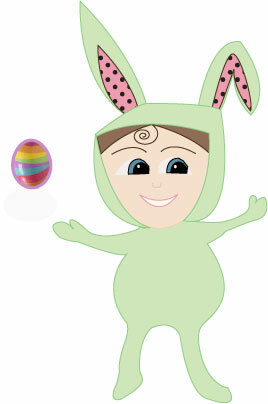 Since it is almost Easter, I thought a cute bunny in my blog would be fun. The Illustration Friday prompt for this week is 'heavy'. I'm thinking that my baby here is looking a little heavy, and so is that Easter Egg. Wow, has it been a long time since I have participated in Illustration Friday. I am going to commit to starting up, faithfully, again. The prompt this week was the 80's. In the 80's, I was in my 20's and drove a hot convertible. Mine was a brown MG Midget, not quite the cool blue one shown here. Blue just worked better in this illustration. The photo is actually one of me in 1980. Look at that 80's hair! Can you believe I could look that young? Both wonderful in their own way, both the subject of myth and legend. I am a personal fan of the moon, as my namesake, the goddess Diana was represented by the moon. When I think 'sacrifice', I think of all the work we do to keep healthy and fit and thin. I especially hate push-ups and I clearly need to do more of them. 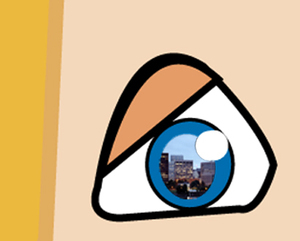 All I could think of was to put a reflection of a skyline in an eye. Not too bad, and quick. The prompt this week was rain...appropriate if you live on the East Coast but not here in Oregon where we have been breaking records by having temperatures above 100 degrees in June! The previous record was set in 1907 and it was 99 degrees. This is the first time in recorded Oregon temperatures that it has passed 100 degrees. But back to you Easterners...with all the rain and flooding, this is how I imagine you feel about it. In other news, the Oregon State Beavers WON the College World Series! This is my alma mater, so I am incredibly jazzed. Just a quick and dirty illustration. Not much time due to having to reload every program on my computer, having my shower try to kill me, etc. When I heard the prompt, I thought of a zebra since my daughter, Bonnie, used to just love everything zebra, and has many lovely zebra objects in her room. 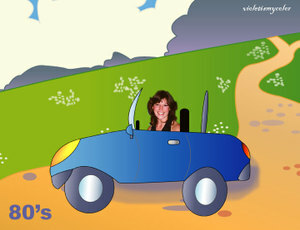 I thought that I would use the base of last weeks illo and build my portait around it. 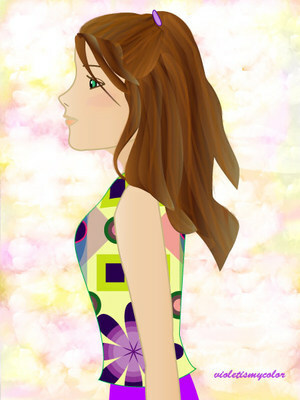 I changed her clothes, her eye color, then 'painted' a background for her. Finished off with the artists signature, and voila! 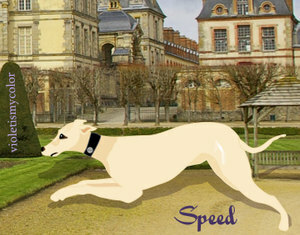 Then, made my banner a little bit more complicated, with someone viewing the portait. This was a fun exercise. Oooo...do you know how MUCH I love cake? I love it more than my size implies, mostly because I only eat cake a few times a year. NOT as often as I would like to...like every day. Bonnie is in Turkey safely, and is so far having a wonderful (and, she assures us, an educational) time. Adam is home from Scotland. He is here till Saturday, when he drives to Bozeman to begin his adventures in Solar Theory. Though he tells us he doesn't exactly know what that means. Ross is graduating tonight and my parents and my MIL are coming out to dinner with us to celebrate. Ross managed to survive the 2-hour (!) graduation practice this morning, while Adam and I waited for him by shopping and drinking frappaccinos. I have been asked by several neighbors if I am up for hire for weeding and carrying around barkdust, since I have been spending so much time doing it. Heck no, I've still got tons of work to do in my own garden, thank you. More later. 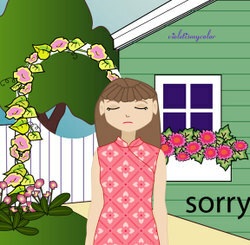 What is she sorry for? She's not stepped on the flowers or broken the window but by the look on her face, she's feeling guilty about something. This illustration was prompted by a memory of my own. This was an incredibly fun illustration for me to work on. I used the same face but flipped over the eyes/eyebrows/mouth...and it made all the difference in expression. I liked the idea of the devil wearing the smart but uncomfortable suit and the angel wearing the comfy shirt and pants. The devil's hot color scheme just feels so heavy versus the cool colors of the angel's, which feels so light. 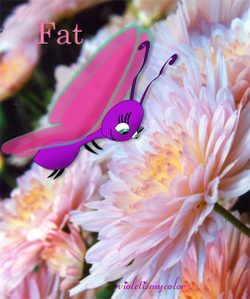 When I thought of what to do for the prompt, fat, I thought of the butterflies that are already starting to flitter around my garden, greedily sucking up the nectar of the many flowers planted there. When I was a child, I used to sneak up on butterflies and pick them up off the flowers they were feasting on. My dad says he used to watch me from a window inside the house and he was always astounded that I could actually catch them. We also had a picnic table in the yard that was (apparently) the perfect place to hang a chrysalis. I used to love to sit underneath that table and watch the progress of my almost-butterfly friends. I still love butterflies more than any other insect in the garden. I'm not sure why we did the Under the Sea prompt here, since we did one called 'Sea' just a few months ago. Ah, well. 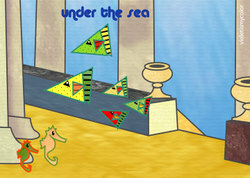 I decided to go with the theme of a ruined ancient temple under the sea, complete with little fishies and sea horses. I had fun playing around with putting textures into the stone surfaces and the sea background. It was so flat looking, before that. I worked on this a little this past weekend and sort of like it. I found this a difficult topic since I wanted to do something distinctly un-robotlike, something different. Anyway, I need one of these to help me keep up with the chores I don't like...like cleaning toilets. So, our little maid here spotted an bunch of hatchlings. Two came out of spotted eggs and one came out of an Easter egg. Surprise!